Do you watch movies not just to have fun but bond with your family and friends? If your answer is yes, then you are a definite cinephile! And if you are, you will enjoy this exciting treat from SM Lifestyle Entertainment – the SM Cinema Movie Marathon 2! SM Cinema Movie Marathon is a special treat for all e-PLUS Tap to Pay cardholders and SM Advantage cardholders for their steadfast support to SM. To stretch appreciations to these cardholders, this month, SM Lifestyle and Entertainment Inc. is giving them a first-rate movie experience! On October 4, all e-PLUS Tap to Pay and SM Advantage card holders can claim a movie passport and watch 6 different movies for free in just a tap of a card! The e-PLUS card allows its users to enjoy faster and easier transactions initially with SM Cinema branches. Now, e-PLUS transaction has expanded to retail stores (SM Hypermarket, SM Supermarket, the SM store, Savemore, Penshoppe, Oxygen, ForMe, Memo), fast food chains (Snack Time, Wendy’s, and select SM foodcourts and McDonald’s branches), SM Tickets, Mall of Asia Arena, Exploreum, SM Bowling and SM Ice Skating, and even parking spaces and UV Express Shuttles in SM Passenger Terminals in Mall of Asia. The e-PLUS card also comes with discounts and freebies from the various participating establishments. With your e-PLUS card, you will be able to watch Committed, The Prince, Pudsey The Dog, The Expendables, Under The Skin and Wish I Was Here all for free! There are two way to avail this promo: (1) register online on www.eplus.ph or www.smcinema.com (2) go to an ePLUS booth in the SM Cinema branch near you. Getting the SMAC 80 Combo Card gets you a 50 peso load on your ePLUS card, a Super Saver Popcorn, and your Free Movie Day passes. All that you need to do is proceed to an e-PLUS booth to have your free movie passport processed. 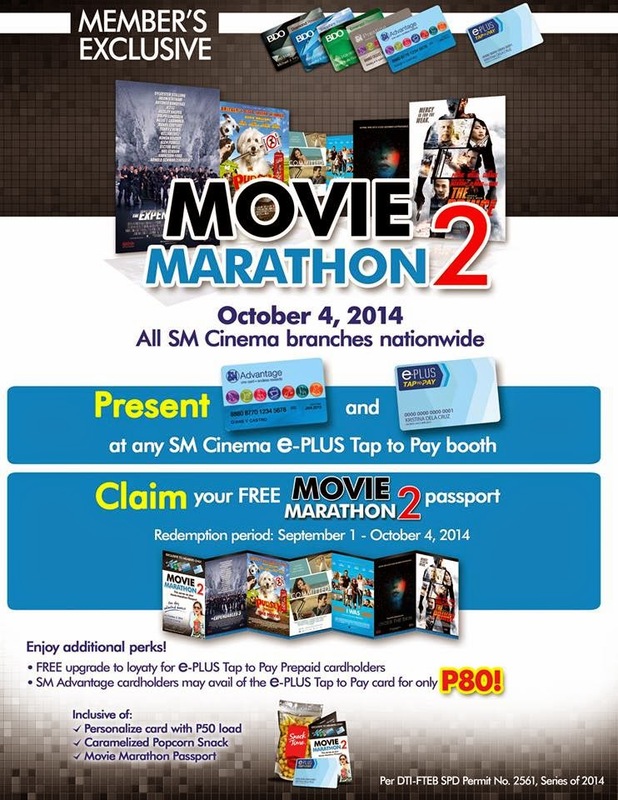 To know more about e-PLUS Tap to Pay and the SM Cinema Movie Marathon promo, you may visit www.eplus.ph and www.smcinema.com.